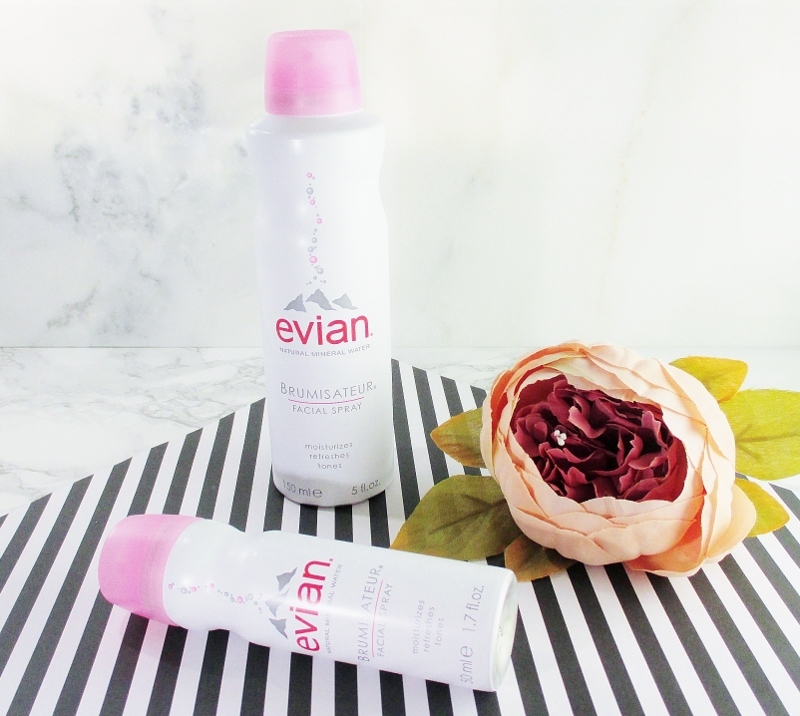 Evian Natural Mineral Water Facial Spray is pure spring water sourced in the French Alps. It takes about fifteen years for snow melt to filter through the layers of soil and rock of the mountains, where it acquires a unique balance of beneficial minerals with a neutral pH of 7.2, making Evian Facial Spray a lovely beauty treatment and the perfect little pick me up for myself and my family. There are a plethora of ways in which Evian Facial Spray can be used and I thought I'd share some of my favorites with you. One way I like to use it, is while applying skin care. A light mist on clean skin, after toner and essence adds a layer of hydration that I quickly seal in with my serum before going on to my eye cream, moisturizer and face oil. The extra hydration helps me to wake up to soft, comforted skin, in the morning. I live in Arizona and it gets hot here in the summer. By mid afternoon, I can start feeling prickly, overheated and out of sorts. 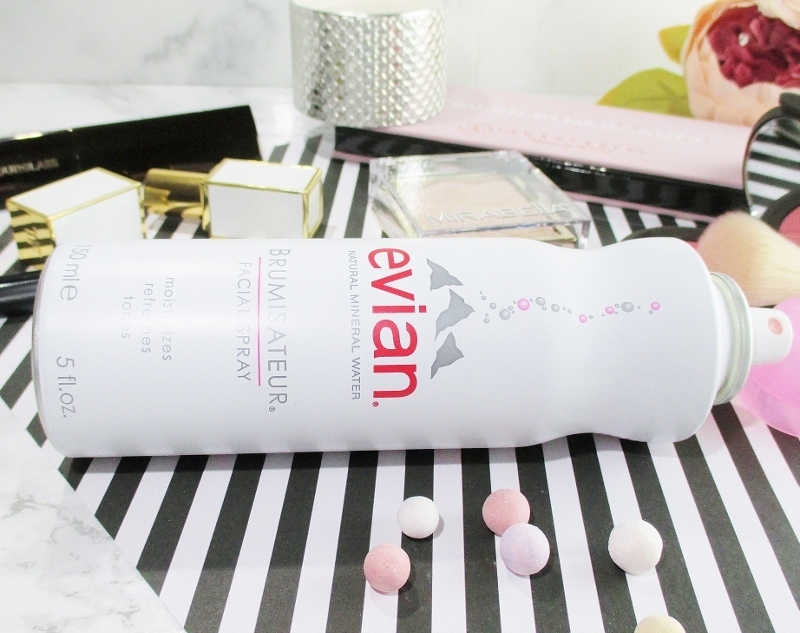 A quick trip to the fridge, grab the canister of Evian Facial Spray chilling in the door rack and after misting my face, decollete and the back of my neck, I am instantly cooler, refreshed and not nearly as cranky as I was just seconds, ago. 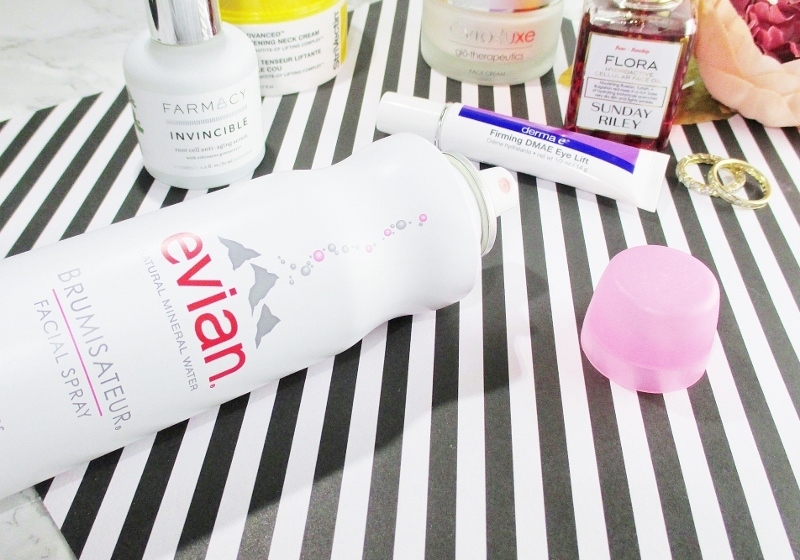 Evian Facial Spray is the ideal makeup lover's little helper. Sprayed lightly on my face after I apply my makeup, it sets, takes down that powdery look and enhances my highlighter. I can trust the ultra fine mist to never spit big drops that would spot and ruin my carefully applied makeup. Got frizzy hair? I do! My hair's natural texture is somewhere between coiled razor wire and a blackberry bramble. I have wurly (a cross between wavy and curly) hair that forms beautiful bends and spirals when wet but even with judiciously applied product it can, if I'm not very careful, expand into a puffy, frizzed out nightmare after it dries. A nice, generous spritz of my Evian Facial Spray reactivates the product in my hair and a few gentle scrunches refreshes my wurls and calms the crazy. Taking a trip? 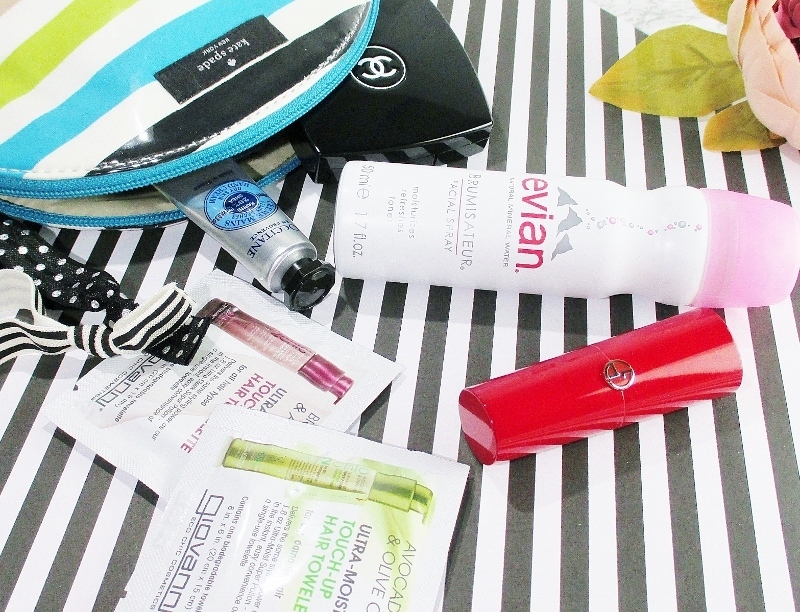 Evian Facial Spray in the travel size is perfect to tuck into a makeup bag, tote or carry on. Thanks to the 1.7 ounce, TSA compliant packaging, you can take your Evian Facial Spray on board an airplane and use it to cool, soothe and refresh yourself or a loved one when that dry, close cabin air starts getting to you. It's also nice to have on hand for a quick touch up while out running errands, to cool down after a fast turn on the dance floor or mist your kids' heated little faces after they have been out playing or participating in physical activities. If you would like to experience this lovely mist for yourself, you can buy Evian Facial Spray from their website, Sephora, Nordstrom and Walgreen's. Evian is social. Visit them on Facebook and follow on Twitter and Instagram. If you would like to enter a giveaway for a limited edition beauty bag containing Evian Facial Spray and a Clarisonic Mia 2, click here by February 1st and good luck! Excellent review, Erika! I used the Evian Spray years and years ago, and loved it so much! I love the fine mist, and the way it makes skin look and feel! I need to get another can! Great review, Erika, for people like me that were always giving side-eye to this product!!! I always wondered, why would I need that?! Now I know, love the hair tip, I'm often in the bathroom doing this at the sink at work all day long! 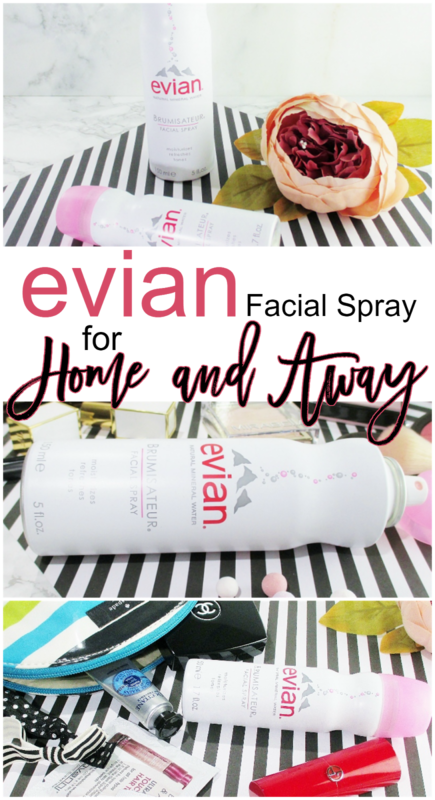 These are all great ways to use Evian water! I always wondered how people used this. I've never used a facial spray but probably should in the Texas summers. I'll pick one up this summer. Thanks for talking about this product. And LOL at wurly hair! I have the same!! I love the idea of a FINE mist--that's my biggest complaint with facial sprays. I love this! When we lived in FL, I would get one in my kids diaper bag, and spray them down on hot days. It's so refreshing! I like using this to dampen my sponges when I don't want them completely soaked! Some nice products from Evian! This is my favorite spray too. I have one on my vanity that I'm hoping to get another week from since I need to buy more. I use it to wet my Beauty Blender sponges. It sprays the right amount especially when I'm in a hurry. I'm going to need this desperation in the summer! This is a must have for me in the Summer!